Can You Use Pam Non-stick Cooking Spray in an Air Fryer? Your air fryer has finished cooking your dinner. You open the drawer, see crispy food, and inhale the aroma of a hot meal. Then you discover that the food has stuck to the basket and the frustrated scraping starts. You wonder if PAM or any nonstick cooking spray would have prevented this problem. But is that what you should use in your air fryer? Would baking or grilling spray be the right choice? The lower quality oils and additives like propellants can damage the nonstick coatings on some air fryer baskets. The coating could start to flake off after repeated exposure to cooking spray. Several reasons actually make PAM and other nonstick cooking sprays are a bad choice. One of the great things about cooking is that you’re in control. You can use any oil that you want in your air fryer. You just need to buy an oil sprayer or mister and fill it with your preferred oil. 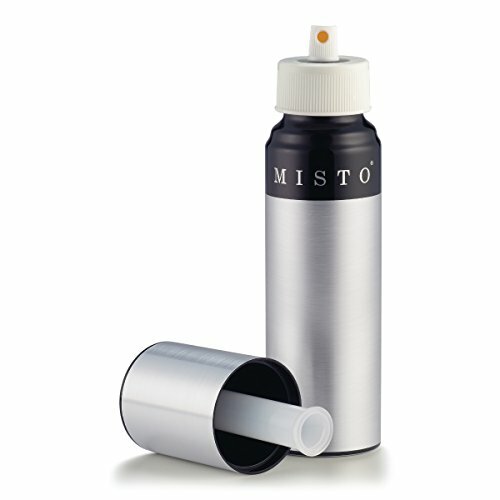 The Misto Brushed Aluminum Olive Oil Sprayer is a popular product that fulfills this purpose. The pump-style cap creates the pressure to spray out the contents, and no propellants are necessary. Buying your own oil sprayer also reduces waste because you can wash it and refill it, which compares favorably to disposable spray cans. As a bonus, you can use the sprayer to spray other liquids, like vinegar or lemon juice. This fact helps to make the Misto even more helpful in the kitchen. The fact that you want to prepare your own meals with an air fryer shows that you care about ingredients. It’s not too hard to guess that the ingredients in your basic can of spray are not premium grade. Soy, corn, or canola oils make up the vast majority of cooking sprays. These come overwhelmingly from GMO crops engineered to withstand pesticide applications. Propellants in sprays should also make you hesitate. These propellants are generally some combination of butane and propane. Those substances might sound familiar because they’re the fuels for lighters and portable stoves. Not all oil sprays are created equal. You can find commercial spray alternatives that meet organic standards. When looking at labels, you’ll want to see that the oil is extra virgin olive oil, grapeseed, organic canola, or avocado oil. Also, confirm that no propellants are present. The label might even say “no hydrocarbons.” Organic oil sprays generally use pressurized carbon dioxide to expel the oil. 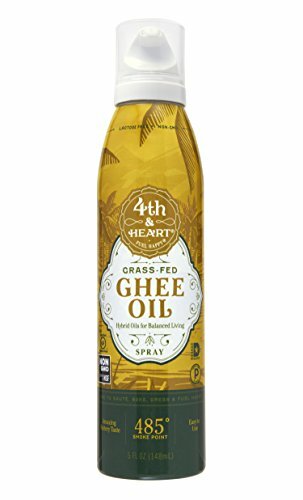 Grass-Fed Ghee Oil Cooking Spray by 4th & Heart - Every spritz delivers butter derived from 100 percent grassfed cattle from New Zealand no less! Blended into the butter is non-GMO cold pressed grapeseed oil. Ghee oil enriches your food with vitamins A, D, E, and K, and it’s a great source of omega fatty acids. With a smoke point of 485 degrees, it’s an ideal spray for an air fryer. 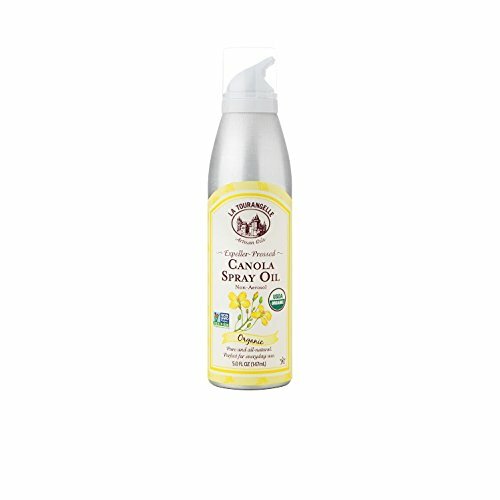 La Tourangelle, Canola Oil Spray - The canola oil in this product comes from European farms growing organic crops without genetic modification. Canola oil actually has a great health profile with a high content of polyunsaturated fat. You’ll find that La Tourangelle prevents sticking while its light and neutral character does not overpower other flavors. With a 400 degree smoke point, it will perform well in the medium-high heat of an air fryer. For most air fryer applications, you’ll want an oil with a smoke point of at least 400 degrees. Baking is one example when oils with lower smoke points would be acceptable. You might have heard of seasoning in reference to cast iron cookware, but the concept applies to other pans, even your air fryer basket. Seasoning a pan involves curing a layer of oil onto the surface to prevent sticking. Thoroughly wash the air fryer pan and drawer and wipe dry. Put the equipment back into the air fryer machine and set its temperature to 400 degrees. At the 3 minute point, take out the drawer and basket. Use a paper towel to rub coconut oil all over the basket. A thin layer will suffice. Return the basket to the hot air fryer and let it heat for the remaining 2 minutes. To maintain the seasoning on the pain, avoid washing it with soap. Just use water and wipe it clean. Repeat the seasoning process occasionally to maintain resistance to sticking. You’ve learned that you shouldn’t use commercial cooking sprays, like PAM. Their propellants and GMO oils don’t check off any boxes on your healthy lifestyle list. Organic cooking sprays offer you a healthier way to apply an even coating of oil to stop sticking. You could also try seasoning the basket, but outfitting yourself with a refillable oil sprayer would be the best option. You’ll avoid throwing out empty cans, and you can always choose the exact type of oil that you want. If you have a question, put it in the comments so you can get specific feedback. Overall, you’ll alleviate food sticking in an air fryer if you select an organic cooking spray or buy a mister.